I hope you're all enjoying the start of Holiday Season! Remember to always take some time out for yourself everyday to restore your sense of calm. These can be challenging days for us..working long hours, running around to parties, planning a bash, cleaning, cooking, baking, stressing about what to wear, stressing about fitting into what we wear, working out, getting dolled up, trying to get the perfect gifts for everyone on your list, wondering how the hec you're going to pay for everything..you all know what I mean. Take a few deep breaths, remember the true spirit of this season and have fun! Our family and dear friends will love us no matter what! People have been asking me if I'm still doing makeup for special events and photo shoots. Of course! Go to my Makeup Website: www.denisegvardian.carbonmade.com I also love to snap pics of cool people and things around the city! Here are some of my most recent sightings...enjoy! City of the Sun performing what sounds like Flamenco Punk..I had to buy their cd...they're that good! Times Square. Twist my arm much? Ahh, Sweet Love...fleeting or forever? 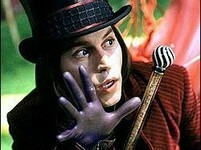 Is that Johnny Depp from Willy Wonka and The Chocolate Factory? Designer Mo Hom wearing her own creations in Times Square. Check out her boutique, Lotus Hom, at 262 Mott Street if you like beautiful, feminine and comfortable clothing! Plaid and Floral work on EVERYONE! Tatiana is wearing a faux Leopard Coat that was a birthday gift from her mother ( mom has impeccable taste) Bag is 3.1 Phillip Lim and Shoes are Jeffrey Campbell. YSL lipgloss no.18 is a gorgeous shade for Holiday Parties! Hey, that's ME on the right, with fellow makeup artist, Farida. I almost never wear PURPLE eyeshadow but I was getting bored with my usual palette of browns and golds. I thought I'd try Laura Mercier's new baked wet/dry eye colour in Violet Sky. I smudged on some LM eyeliner in Black Violet as well. The verdict is still pending...give it a Go or hell to the No??? *For a more subtle look, try LM's baked eye colour in Ballet Pink. It's got just the right amount of sheen and a hint of pink. Some Holiday looks I love...taken from my favorite magazine of all time ...VOGUE! Some other easy breezy suggestions for the Urban Glamour Girls on your list..
Tickets to concerts, movies, off Broadway shows.. The list goes on and on...feel free to ask me for suggestions for anyone on your list!